I have to admit that I've made many renditions of this kind of chocolate cake. This is the kind of dense (no leavening other than eggs), super-chocolaty cake that I'm quite partial to. It's the kind of cake that needs no frosting - a dusting of powdered sugar, maybe a dollop of whipped cream is all you need. It feels like a fancy dessert but it's really so simple. This recipe called out to me because of what it is and also because it's another great back-pocket sort of recipe to have. When you need a dessert and want a chocolate one (which applies to me in almost all instances, hence, why I need so many of these chocolate cake recipes to rotate through), you can make this with a few eggs, some butter (salted in this instance), sugar, and good dark chocolate. There's nothing fancy going on here - yes, it calls for fleur de sel French sea salt but if you don't have it, you can use another kind of sea salt. That said, I do think fleur de sel is a worthwhile investment; not only can you use it for baking but I love sprinkling it on my soft boiled eggs. Making this cake does not require any machines and there are no egg whites to whip separately. 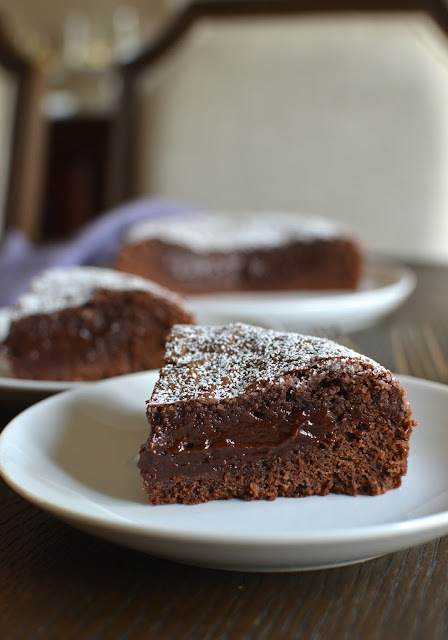 You can make the batter very quickly and before you know it, your family and you are enjoying a slice of wonderful chocolate cake and making an occasion out of it. This recipe comes from Mimi Thorisson's new book, French Country Cooking, which I am loving. If you love cookbooks you can read, I think you'll enjoy it as much as I do. I divided the recipe in half and made this 6-inch version to share with my family. I was very happy when I sliced into the cake and saw the soft, fudgy center. It was just what I was aiming for. You can bake it a few minutes longer for a firmer, more set, center but my family and I all agree that the gooey center of a chocolate cake like this one is the best part! It tastes extra rich and decadent for the same number of calories. Plus, the textural contrast between the middle and edges is nice, too. And in case you're concerned, it's not too salty. The salt gives the cake a nice rounded edge but you don't distinctly identify it. While we were sitting down to cake, I asked my 11-year old son whether he'd prefer this cake or the Victoria sponge for "tea" if given a choice. He said, fairly diplomatically, that the Victoria sponge is good but he likes this more. I think maybe, just maybe...I have to agree with him. For us, it's always chocolate for the win. I love recipes that look like this! It's just that easy. You slow down and make a simple cake. Before you know it, the ingredients have been combined and the cake batter is ready to be scraped into the cake pan. Mine goes into a 6-inch cake pan. It took just about 30 minutes (similar to the time it should take for a 9-inch round cake) for the cake to puff and fully set; I watched it carefully after about 20 minutes to make sure to get it just as it set so that the center would hopefully be moist. This is the cake just taken out of the oven. It will settle down a bit as it cools, sinking a bit in the center, especially since I pulled it out of the oven just as it set. Let the cake sit in the pan for about an hour before unmolding. Then, it's time for a little dusting of powdered sugar. The recipe suggests a handful of red berries or currants on top for a pop of color. I think that would be especially pretty for the holidays. I didn't have it on hand so I kept it plain. The reward is in slicing, serving, and of course, eating. Chocolate cake for dessert is always a good thing at my house! Preheat oven to 325 degrees. Grease a 6-inch cake pan with butter and line the bottom with a round of parchment paper. Set butter, chocolate, and instant espresso powder (if using) into a heatproof bowl set on top of a pan of just simmering water. Stir until just melted, then remove from the heat and let cool for 5-10 minutes. In a bowl, whisk or sift together the flour and fleur de sel. In a medium bowl, whisk the eggs and sugar together until light and fluffy. Stir in the cooled chocolate mixture. Add the vanilla extract. Fold in the flour mixture until just combined. Pour batter into the prepared cake pan and bake for about 30 minutes, until cake is puffed and just set (keep a close eye on it if you prefer the center of the cake to be moist and slightly gooey, like I do). Let the cake cool in the pan for about 1 hour before unmolding. Place cake onto a serving plate, top with berries, if desired, and sprinkle with confectioners' sugar. I do love that gooey molten-style center! Rich and divine! Okay you have sent me to the moon today Monica! I just want to lick the cake - that may sound gross but it's true. I love Mimi's recipes and her blog - what a life they live. But this cake ... with the soft middle and crispy edges - it is perfect. No icing, no fancy toppings, just perfect chocolate cake. Once a month we host a family dinner with our children, their spouses and all the grandkids. I'm making this cake to share so I don't have to eat it all myself! Thank you Monica and I hope your son enjoyed his night of tricks and treats! You are too kind, Tricia! I love Mimi's new book...I was really surprised (pleasantly) by it. What a truly unbelievable life she has and it's great to see. This cake is everything you said...make a big one and share! I don't think anyone would complain. Halloween was a busy day but a gorgeous one. It was fun! What a pretty looking chocoalte cake with salted butter. Delicious and classic. And that gooey molten center is making me drool, Monica. That center is my favorite too and the contrast together is nice. Thanks, Anu. So cute that your son chose this cake too :) Chocolate cakes are my husband's favorite and I love how simple this one comes together without a mixer! This is just perfect when that chocolate craving hits and the powdered sugar adds such a pretty touch! Oh my goodness look at how fudgy this cake is!! You're making me want dessert before I even have lunch! haha And I love that your son was so diplomatic when choosing :) That made me smile! I just received this book in the mail yesterday, it is beautiful!love how she writes, will have to make this cake, looks delicious!!! Mmm you're right that this needs no frosting! Salted butter is dreamy and this cake looks beautiful! WOW! This cake looks so rich and delicious. Bookmarked! Thanks, I hope you try it...very easy and tasty cake. I'll take a slice of simple cake like this over one with lots of icing…it sounds good. Thank you, Karen. Thank goodness for simple cakes that are also so good! That gooey fudgy center is too die for! It's calling my name! I enjoy salted chocolate ice cream and I think I would love this cake. Birthday is over, but I'm so making this for myself! Loving that luscious almost pudding like center to this chocolate and espresso cake. What a treat! I am thinking this would go perfect with a little afternoon coffee/tea. Love any and everything that works well for afternoon tea/coffee. : ) Thanks, Bobbi! What a wonderful cake with pudding in the center. It's calling my name for sure. I hope you share this at our link party, Dishing It & Digging it every Sunday 4:00 EST. I also wanted to share a new Recipe format for printable recipes for people using Blogger. The Recipes Generator You can try it out for free on the blogspot site, but you will not get the html code, unless you buy it. It is only $20.00. My friend designed it when I told him there wasn't anything like WP recipe plugins for Blogger. Thank you and thanks for sharing all the info. I love a fudgy cake, and this one sounds perfect! You just can't have too many recipes. Baking with salted butter is unusual, but I'm going to trust you on this one! What a great sounding cake, how could you not want a massive slice! That runny slice is a killer!!! That's definitely my favorite part, too.